I have no recording dates, but LPs featuring Don Williams and Earl Mays were originally issued during the 1960s. They were recorded in their own Knoxville sound studio, advertised on syndicated radio shows and distributed via mail-order. Because I don't have all the LPs and cassettes, and because numbering schemes varied, the order isn't necessarily chronological. The gaps between known issue numbers show that the list is far from complete. I've transcribed information on several recordings wholly from promotional material. I've also listed cassettes and one LP which Earl Mays recorded with his wife Libby after the death of Don Williams. These, I believe, were made during the 1990s. IMPORTANT: this is a discography, not a list of recordings for sale. Cassettes are still available from Earl Mays at Box 181, Knoxville, Tennessee 37901. The Don & Earl LPs in my possession were distributed in white paper liners and without jackets. IMPORTANT: LPs and 45s are not for sale! Issue Number unknown. All information on this recording has been taken from two order blanks circa 1960s. This was also known as "The Angel of Peace Album"
. . . is the 6-song E.P. mentioned in the Order blank for Record 4. All information from advertisement in "Don and EARL'S SCRAPBOOK and CHRISTIAN MAIL ORDER CATALOG" undated, late 1960s. if you order within 5 days. 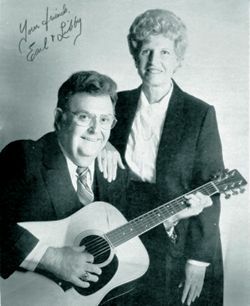 Undated, but recorded after the 1985 death of Don Williams.